To promote the Professional Wild Bull Riding Association, the Forum in downtown Tampa had some bull-theme promotions and of course Rocky the Bull -- the USF mascot -- was invited before tonight's Lightning hockey game. I let him check out my wheels . . .
. . . which he used to bike away . . .
. . . until he came back. These two girls stood on Hillsborough Avenue this afternoon trying to get customers to sign up for a free bicycle raffle -- and maybe get them to try some arroz con pollo at Pollo Tropical. The Florida Gators football team, fresh off their second national championship in three years, is quite popular these days. The orange and blue colors and Gator logo are showing up everywhere. At SWFBUD member store Oliver's Cycle Sports in new Tampa, the Gator logo is everywhere on this little kid bike. A real collectible. Even the training wheel "hubcap" has some Gator action. Ghost Rider Writes Tampa About No Bike Lane On Busch Blvd. 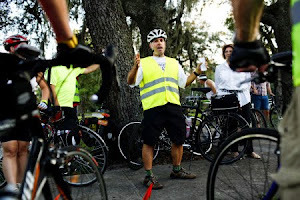 Bicycle advocate Jack Sweeney has written a letter to the city of Tampa's public works director, Irvin Lee, regarding the repaving of Busch Blvd. and its lack of a bike lane as part of the repaving. I was riding around Tampa today when I came across the extensive repaving/restriping project along Busch Blvd., from I-275 east to the Busch Gardens area. What better time to add a bike lane stripe than during a repaving/restriping project? Also, think of the message a freshly-paved boulevard with painted bike lanes and appropriate "share the road" or "bike route" signage would send to those many tourists: "Tampa is a progressive community that is thinking about alternative transportation forms." I encourage you and your staff to seriously consider and make efforts to implement the addition of bike lanes and signage during future repaving projects in and around the City of Tampa -- there is a small but growing group of residents who choose to use bicycles as transportation rather than contributing to the motorized traffic our city is plagued with, and we would sure love to see some improvements in the infrastructure available to us. On tonight's 6 o'clock news there was another hard-hitting Super Bowl story by Channel 8 -- the NBC affiliate here in Tampa. Oh, did you know NBC just happens to be broadcasting Sunday's Super Bowl? After the video showed stuff like crab legs and chocolate-covered strawberries, Gayle Sierens, the Channel 8 anchor cooed, "My, my, my, that looked good." I realize NBC is the network broadcasting the Super Bowl and Channel 8 is the hometown NBC affiliate. But the TV cheerleading on Channel 8 for the Super Bowl is way over the top. Crab legs and homemade desserts. It's a weird vibe in town. I bike around the Tampa Bay area and see empty stores and restaurants like Bennigan's and Linens N Things. But then you see high rollers swarming into Tampa for high-powered partying. For a few days, anyway. Ooooh, the Maxim Party. Don't want to miss that one. The emperors have arrived and Rome is burning. And I'm not talking about the sports talk show. Our nation's executives received $18.4 billion in bonuses last year. This year, a record number of workers requested unemployment benefits. Even Springsteen, the working-man God, was dipping into the well. The blue-collar rocker thought the Super Bowl halftime show was a novelty. That's why he never played Super Bowls before. But he's playing Tampa on Sunday because he has a record coming out. At a press conference today, he commented on why he turned down previous offers to do halftime before: "Initially [the halftime show] was sort of a novelty. It didn't feel quite right." But why he changed his tune and is playing Sunday's gig: ". . . we have a new album out, dummy!" My hometown -- sure, Bruce. But good thing Tampa got the Super Bowl. I saw this beauty outside Tampa City Hall. It's an old Trek 850 mountain bike, an intro mountain bike, which has been outfitted with a cool handlebar and check out the front rack guards. Cool stuff. Specialized and Trek will be having demo days during the next few months. Mark Feb. 15, a Sunday, on your calendar for a Specialized Demo Day ay Flatwoods County Park. Bring an ID, you must wear a helmet and yoyu need to sign a waiver. The time for the demo is 9AM to 4PM. There is no cost. A Specialized factory tech will be on hand. SWFBUD member store University Bicycle Center is sponsoring the demo. This afternoon I biked into downtown Tampa to conduct some business, then made a pitstop at the Super Bowl Media Center at the Tampa Convention Center. It was a motley mix of lookaloos, geeky autograph seekers and slick-looking former NFLers who are hanging on as interviewees. This little fella was hoping for an autograph from Warren Sapp. Twinkle Toes Sapp blew the kid off. This guy has a whole stash of footballs ready for signatures. If you've ever seen a pack of turkey vultures descend on a freshly-killed raccoon, you'll have a sense on the scene when the horde of autograph-seekers descended on Joe Montana, the former great NFL quarterback who won four Super Bowls with the 49ers. Outside the Media Center at the convention center, the NFL Network had its stage. It's a wonderful convergence of nattilty-dressed nerds such as Rick Eisen, former NFL pros such as Terrell Davis, geeks holding footballs to be signed like some of the folks pictured in this post; and then there's the cool, hip, chic makeup girl. Like this woman . . .
. . . and her shoes. This fella put his football on display with style. He snagged the Joe Montana autograph. Check out this football -- it has Montana's likeness on it. Across the street, the tallest poster of the Super Bowl victory trophy adorned the Embassy Suites. This morning I represented SWFBUD before the DOT Community Traffic Safety Team, which is a group of law enforcement, social service, engineering firm and state road members who are concerned about road safety. 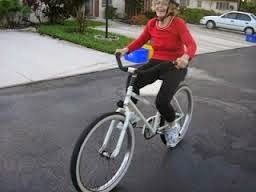 I brought it to the attention of the DOT and the CTST that there are dangerous gaps in the concrete sections of the Hillsborough-Nebraska Avenue intersection in Tampa that can easily catch a road bicycle front tire and pitch the cyclist into traffic. Here are the photos of the problem. Thank you for allowing me to bring these items to your attention. I have submitted photos to show the dangerous gaps and space between the concrete sections in the Hillsborough Avenue-Nebraska Avenue intersection in Tampa. The gaps can easily allow a bicycle wheel to get caught and cause a bicyclist on a road bicycle to lose control, tossing said bicyclist into traffic and imperiling his or her life. I hope the DOT can please repave that intersection or at the very least, fill in the gap so that there is no open space. In addition, I would like to reiterate SWFBUD’s request to please assure the safety of bicyclists who are now using the Gandy Bridge in light of the closure of the Friendship Trail. SWFBUD is asking the DOT to look at what can be done to make conditions safer for bicyclists on the Gandy Bridge. One option is looking at the shoulders and installing concrete barriers to separate bicyclists and vehicular traffic, thus creating a safe cycling space for bicyclists. Some downtown Tampa ambassadors actually ride bicycles to pass the love. Way to go, my pedaling ambassadorial comrade. This afternoon I bicycled into downtown Tampa to catch the live TV shows being produced by ESPN in a waterfront park behind the St. Pete Times Forum. There was Trey Wingo, Merrill Hoge and Mark Schlereth doing an NFL show followed by Jim Rome and his Rome is Burning show. During the NFL show when the ESPN cameras panned in on a motley bunch of football fans behind the set, the fans began to mug for the camera. Then Grandma the Steelers fan hauls little pudgy Johnny in front of the ESPN TV camera and the kid goes ballistic, crying and terrified of nutty football fans screaming their brains out during the ESPN NFL show. Looks like that not only does Grandma feed little Johnny like he's a spawn of the Michelin Man, she also makes the kid the centerpiece of a screaming mob. Oh yeah, that kid is just thrilled. Finally, the kid gets to walk away. Looks like this is one kid destined to grow up into a nose tackle. ESPN's NFL guy, Chris Mortenson, gets a little powder to the face. Glad to see that ESPN doesn't orchestrate the crowd noise when they have live sets. After the NFL show, Jim Rome did his "Rome is Burning" show and scored the big-time LT -- LaDainian Tomlinson -- for his show. Wanna see fans go nuts -- just point a TV camera at them. Fans showed no love for Merrill Hoge, who strolled away without anyone even asking for an autograph. After the NFL show, pretty boy Mark Schlereth posed with fans for shots. And we end with my favorite T-shirt of the day. 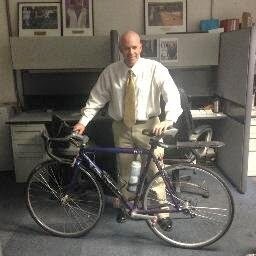 I contacted Mickey Farrell, manager of the Bucs football stadium for the Tampa Sports Authority, and floated the idea of workers using bicycles to get around the Super Bowl area that has taken over the stadium site and adjacent lots. Mickey said everyone is using golf carts (how green is that?) to get around the site and it would be dangerous to ride a bicycle with so many golf carts whizzing around the place. The Police Unity Tour, which raises money for a law enforcement memorial in Washington, DC., is having a NIGHT GOLF TOURNAMENT fund raiser. Contact Ellen Pierson at 813-225-7160 x35 by Feb 20, 2009 with your winning foursome. Want to see Lance Armstrong's weight work out? Check it out here. 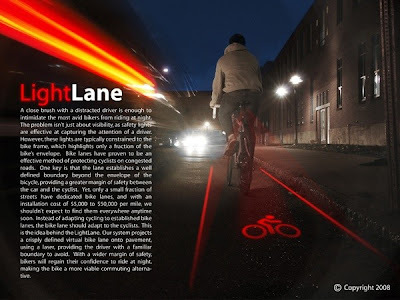 Your own bicycle "light lane." Don't leave home without it. This afternoon I addressed the Tampa-Hillsborough Expressway Authority board and asked the board members to consider allowing bicyclists on the top deck of the Selmon Expressway for limited times on Sunday mornings. I explained to the board at its 3 p.m. meeting that Hillsborough and Pinellas Counties have closed the Friendship Trail, so bicyclists lost a vital resource. I also told the board it would be great public relations for the Expressway Authority. And besides, it's been done before -- I joined more than 200 bicyclists on the top deck for a bicycle fundraiser for Amanda Lee that was organized by Rochard Gonzmart in September 2006. In response, the board voted to have its staff look at the idea. Board member Thomas Scott, who chairs the Tampa city council, made the motion and it was approved unanimously. So, the staff will take a look at the concept. In the meantime, please send emails to the Tampa-Hillsborough Expressway Authority asking them to allow bicycling on the upper deck during LIMITED TIMES on Sunday mornings when there is little use. Here's what it's like to bike on the top deck of the Expressway. SWFBUD thanks Karen Kress, transportation director of the Tampa Downtown Partnership, who came to the Expressway Authority board meeting and added her support. And SWFBUD also thanks Tampa Councilman Thomas Scott for making the motion that allowed for the study. 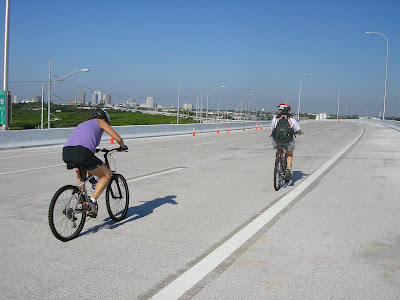 On Saturday afternoon while I biked on the Gandy Bridge shoulder from St. Pete to the Tampa side, a bicyclist was pedaling against traffic and heading straight for me on the same shoulder. I stopped and wanted to chat. I wanted to find out why he prefers to bike against traffic. If you bike on a lot of roads around here, you've encountered them -- people on rag-tag bicycles coming right at you. They almost never wear a helmet. They're often poorly fitted on the bicycle. Like the guy I met Saturday afternoon. 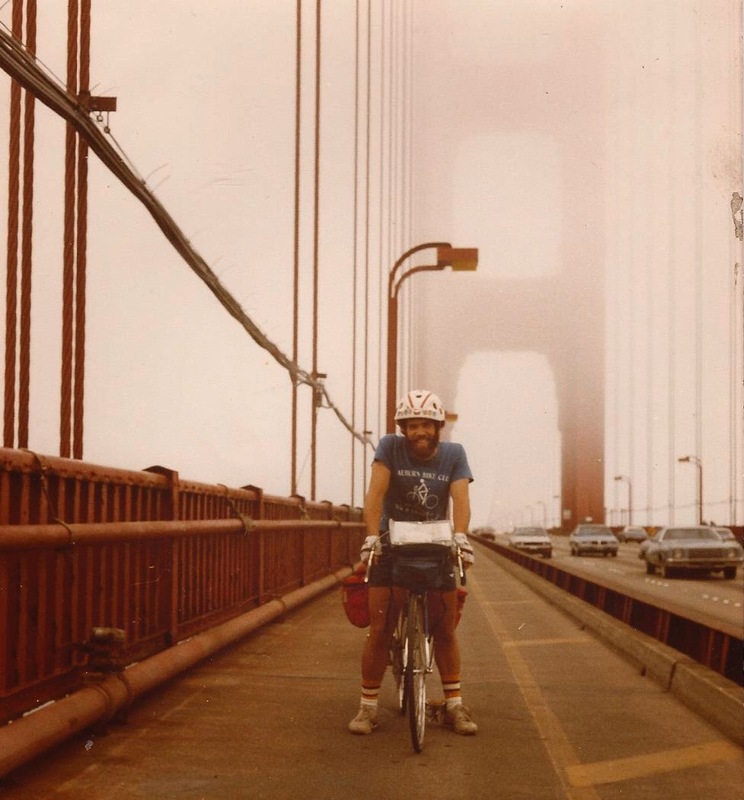 He had a metal basket on the handlebar and a floor pump attached to his frame via black electrical tape. He wore stylish black dress pants with pleats, and gray wool gloves. Weatherbeaten face, no helmet of course. Several leather pouches carrying pocketknives also dangled from his belt. He explains he bikes against traffic because that's the way he learned while growing up in Nebraska. He said he wants to see cars coming at him so he can avoid them if they veer right into him. He didn't want to hear about biking with traffic. 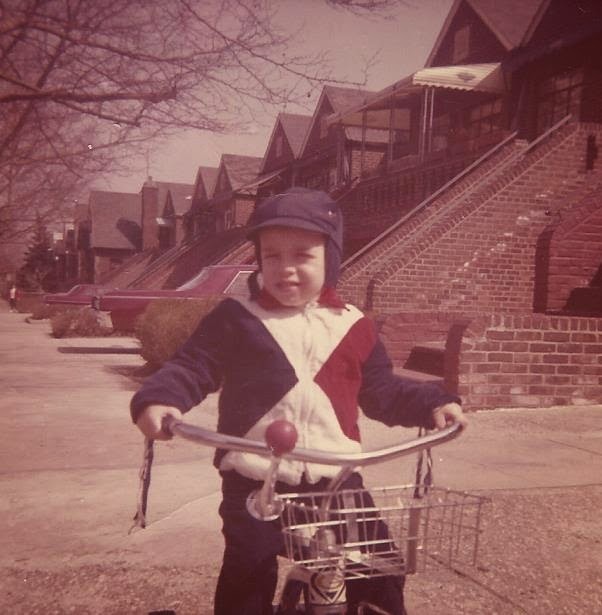 He then took off and continued biking west as the cars whizzed by him in the opposite direction. It was another splendid day of afternoon cycling, as I returned to the Gandy Bridge to bike over the bay to St. Pete and back to Tampa. I passed the Super Bowl site along the way to get another glimpse of the NFL Experience going on for fans. Of all the hawkers, peddlers and parking wavers I thought this fella was the most intriguing. He was in a wheelchair but it didn't stop him from trying to coax drivers off of Himes and onto his front lawn for some parking. This lady is trying to get a customer to park in a specific direction. The dollars had her stoked. The Weeden nature preserve and fishing deck is a special place. Bicyclists often visit the place. And I stopped by, too, this afternoon. 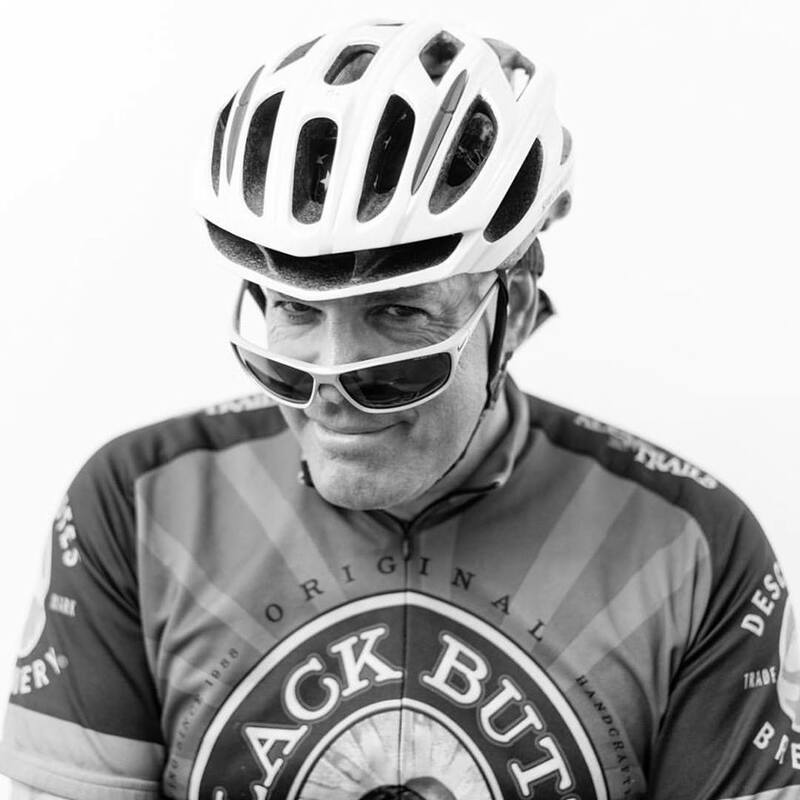 I don't have to tell you that there is a wide assortment of bicyclists out there. Like this fella, who uses a balloon to alert drivers. 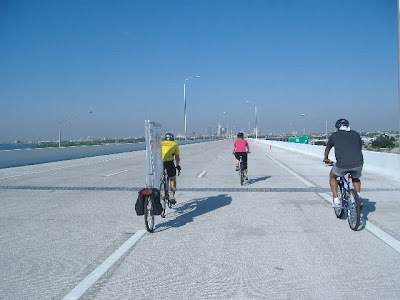 Want to see what it's like to bike on the regular Gandy Bridge between Tampa and St. Petersburg? I'm heading east and heading back into Hillsborough County. Anybody seen Boo? Saw this sign on Hillsborough Avenue near Habana on the way back from St. Pete. 12:05 PM: Bush Era Closed. Obama In.